Not content with producing just one terrible tablet, Lenovo took the exact same specs of the Yoga Tablet 8 and shoved them into a slightly larger frame. The Yoga Tablet 10 is basically just a bigger version of the company's 8-inch slate. You still get awesome battery life (12 hours and 10 minutes of HD video playback on a single charge), but the Yoga Tablet 10 has all the same faults as its fun-sized sibling. The metal kickstand is still difficult to use and the build quality is on par with what we saw on the 8-inch model. The quad-core Media-Tek processor struggles to keep up with the most basic of tasks and starts to chug while playing games or watching HD videos. 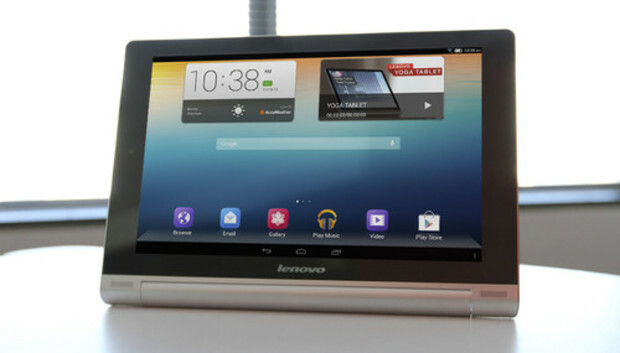 The screen on the Yoga Tablet 10 boasts the same 1280 by 800 resolution as Lenovo's 8-inch slate, making text and movies appear fuzzy and undefined. Lenovo should have upped the resolution for the larger screen size, but instead was content with a display that's a complete eyesore. The screen upgrade also wasn't kind to Lenovo's custom overlay, which looks like a cheap iOS 6 knock off slapped on top of Android 4.2 Jelly Bean. At $300 the Lenovo Yoga Tablet 10 is priced favorably against other 10-inch tablets (unlike it's 8-inch sibling), but you get what you pay for. Aside from the tablet's stellar battery life, every other aspect of the Yoga Tablet 10 is a huge let down. Although the tablet may seem tempting to shoppers on a budget, you're honestly better off saving your money for a more premium tablet that offers a better overall experience.